Here are some tasks to try, they are a mixture of 'traditional' fixed tasks, comprising a pre-determined number of turn points, or 'Enterprise' style tasks, which allow more pilot decision making on route. Which ever type of task you fly, make sure you have checked Notams for any airspace restrictions! Extended Local Soaring Task - 33km! This is a task that allows you to practice flying a real task, making a valid start, turning 3 turn points and then a final glide back to Saltby, without ever needing to be out of gliding range! An ideal first task or one for practicing thermaling skills or getting used to your new navigation equipment! Start from Saltby, fly to Belvior (BVR) then Grantham (GRA), down to Colsterworth (CSW) and finally back to Saltby. Additionally you can do multiple laps to make your task longer. Remember you still need to check Notams for any airspace restrictions that may occur on the day. Keep a good look out too! Anyone for Tennis?! This is an "Enterprise" style task which involves a horizontal line through the centre of Saltby (SBY). 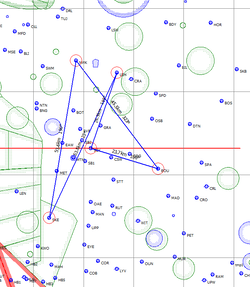 The task is to fly to within 1km of any BGA turn point above or below the line, and then to cross the line (think tennis 'net') and fly to within 2km of any BGA turnpoint on the other side, repeat this crossing of the 'net' up to 3 times, turning as many turn points as you wish, before returning to Saltby (SBY). A sample task is shown to the left. You can decide which BGA turn points to turn as you fly and you score the flight as 1 point per Km between each turn point, starting at SBY, plus 5 bonus points for each turn point turned. By using turn points close to Saltby, such a Belviour Castle (BVR) and Colsterworth (CSW) you can create tasks that stay close to the airfield, or venture further field, such as shown in the example, which would score 205 points worth of Km plus a bonus of 20 points for the four turn points. 100k Club Triangles This is one of the club 100km triangles, suitable for a BGA 100km diploma. The two turn points are Newark (NWK) and Skeffington (SKE). You will need to declare the flight and fly it according to BGA badge rules. An alternative triangle is to use Crowland Airfiled (CRL) and Melton Mobray (MET) for a 105km triangle. If you want to fly these for fun, you are allowed to count them as declared flights on the BGA ladder, even if you have not declared them, as they have been nominated as 'club tasks'. Remember that for badge flights, the start line is a 1Km line (0.5km radius) ! 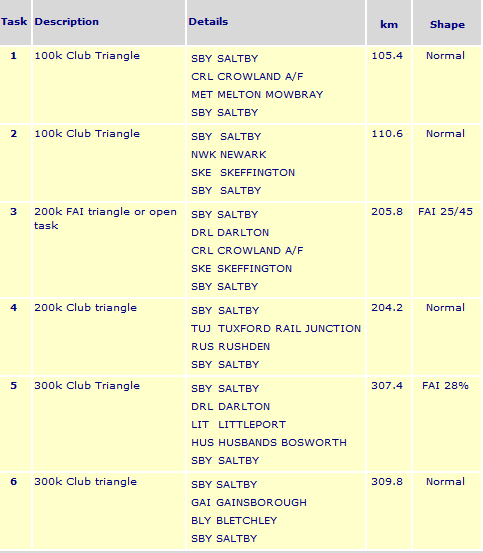 300k Club Triangle This is one of many 300km flights possible from Saltby and your primary choice of a task should be based on Notams and weather! IF this flight makes sense once you have checked both of these then it is a valid 300km triangle for you to fly and enjoy! The task, from Saltby (SBY) to Caxton Gibbet (CAX) to Morton in the Marsh (MOR), is 305km. The leg between MOR and SBY has airspace limitations on the maximum height you can climb to, so many pilots choose not to 'cut the corner' but rather fly back along the second leg (CAX - MOR) and take advantage of any higher cloud bases, without the airspace limitations. Remember to check the current airspace restrictions on your up-to-date chart and to adjust your altimeter or 'PDA' to correctly give you a flight level (FL) reading. Three Legged Race This is another 'Enterprise' style task, consisting of 3 legs, north, south and east, each leg has 6 BGA turn points at distances between 7km and 116km away from Saltby. The task is to fly down one or more leg, to any of the 6 TPs, and then fly back to within 2km of Saltby (SBY) and then, if you wish, do the same down another of the legs. The minimium task would be to turn the closest TP (CSW) and return to SBY, scoring 14km (7km out and return), the maximum would be to turn the furthest TP on each leg (returning to within 2km of SBY each time) for a total of 680km! You can decide which TP to turn and which legs to do whilst you are flying. CHECK NOTAMS before you fly, to make sure there are not airspace issues either on-route or at the chosen turnpoints and then adapt the turn points to avoid these restrictions! About a third of the way down each leg is a gliding club, to help minimise the chance of a field landing. Have fun! Club Ladder Tasks - These do not need to be declared in advanced on the BGA Ladder, but still count as a declared flight! Remember to check notams and to fly the tasks to avoid airspace!